As Hitler came to power, the discontent in the ranks of the Sturmabteilung (SA – Storm Detachment or Assault Division), the paramilitary brown shirts led by Ernst Röhm who played the decisive role in the Beer Hall Putsch (the Röhm-Putsch) in 1923, became wide spread. The group started to accuse Hitler of betrayal stressing the need for another «genuinely socialist» revolution. At the time Fuhrer planned to make SA part of Reichswehr, the regular German military. In view of great services and merits earned in the days of revolution Röhm cherished an ambition to absorb the Reichswehr into the SA under his leadership. There were around 3 million brown shirts under his command. The leaders of the Reichswehr feared and despised the SA; they strongly opposed the idea of merger pointing out that it would be wrong to put the armed forces under the command of someone who led irregular formations. The army leaders planned to make brown shirts part of national armed forces while keeping Röhm away. It was planned to transform SA into a militia force guarding the border with Poland and use paratroopers as instructors responsible for training would-be volunteers before they start service. Those days the German army was a militia force. Only on May 21 1935 conscription was re-introduced. The Schutzstaffe (SS) and the Gestapo, the regime’s secret police, started preparations to deliver a blow against the SA leadership. Hitler hesitated. He had sympathy for stormtroopers but needed the support of regular armed forces. He found it too risky to order self-liquidation of stormtrooper formations and openly challenge Röhm. But the threat of upper bourgeoisie, the military and aristocracy getting together against him pushed Hitler to take action. The fate of his nationalist brothers-in-arms was sealed. The following purge strengthened and consolidated the support of the Reichswehr for Hitler. It also provided a legal grounding for the Nazi regime, as the German courts and cabinet quickly swept aside centuries of legal prohibition against extra-judicial killings to demonstrate their loyalty to the regime. The Night of the Long Knives was a turning point for the German government. It established Hitler as “the supreme judge of the German people”, as he put it in his July 13, 1934 speech to the Reichstag. The stormtroopers left alive after the purge became part of SS units under direct Hitler’s and Himmler’s command. The 1933-34 events in Germany and the contemporary situation in Ukraine. The Pravy Sector militants played the role of stormtroopers in November 2013-February 2014. Right after the coup Yarosh declared his intention to continue the «nationalist revolution». There was a wave of treason accusations against the Kiev junta. A. Belitzky, a Pravy Sector group commander, said, «The government can hardly be called legitimate and it has not much time left. We are growing critical towards it with each passing day». A bit later Maidan militants issued a statement accusing the new «national leaders» of criminal activities. The militants wanted the Narodny Veche (people’s assembly) to call a constituent congress representing the Euromaidan, paramilitary organizations, territorial assemblies and mayors of large Ukrainian cities. The power of parliament was to be vested in the congress which would appoint an interim government, start the process of preparing a new constitution and legislature and create conditions for complete reform of state power leading to enhanced authority of local administrations and the formation of local self-defense units. Otherwise the junta leaders would face a people’s tribunal». Like the German stormtroopers headed by Ernst Röhm, Ukrainian militants want to acquire control over state power structures and the armed forces. They want Pravy Sector troopers to get access to military warehouses, as well as a chance to use military installations for combat training. Like in Germany it sparks a conflict with regular military that flatly refuse the idea of granting Pravy Sector formations the status of regular armed forces units. Actually the Kiev junta acts the same way as Hitler did preparing for his purge against the Rohm’s stormtroopers. 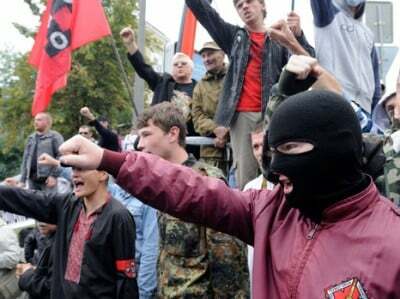 On the one hand, the Yarosh-led formations quell protest in Novorossiya (literally New Russia, a historical term denoting an area north of the Black Sea which was conquered by the Russian Empire at the end of the 18th century) and crash on political opponents making it impossible for the weak regime to refuse cooperation. On the other hand, the government wants to put the Maidan militants under its control. One of the Yatsenyuk deputies said that H-hour is near when Maidan and national TV will announce that the Pravy Sector formations are illegal and the militants will be detained to face justice. The police and security service have ordered to give in all weapons and the parliament has taken a decision to form a National Guard to include all Maidan self-defense units. But the militants refused to comply. According to Yarosh, the Pravy Sector formations number about 10 thousand people across the country and nobody has joined the National Guard as yet. To make the Ukrainian scenario fully repeat the events in Germany, Pravy Sector is to suggest that the regular armed forces, police and special services join its ranks. I believe the offer is to be announced soon. The March 13 law on the National Guard states that the new formation is responsible for maintaining law and order during mass public actions, the protection of government agencies and officials, putting down armed unrests and responding to provocations on state border, fighting illegal armed groups and quelling any attempts to stage coups. It means the National Guard is to fulfil the functions of regular military and law enforcement agencies. It has its own army units and aviation what makes it «a state within a state». Being under direct control of Turchinov (Timoshenko) makes it stand above other power structures. The German SS started as a Führer’s personal guard unit. Later it got separated from SA to become an independent structure under Hitler and Himmler. Like in Ukraine now, the Hitler’s SS had its own troops and police units. It saw its first combat action on the Night of Long Knives dealing with its former brothers-in-arms. The National Guard’s functions make inevitable a clash with Maidan self-defense groups and Pravy sector formations. SA troopers were offered a chance to join SS, the same way the Maidan militants are called to fill the ranks of National Guard. When the time for reckoning comes, it’ll be too late. One of Ukraine’s political scholars said that Timoshenko ordered Turchinov to «clean Maidan from garbage». The candidate for the «Führer’s» position is back, she is in Kiev now. The garbage is still there but the preparations for cleaning are underway. Foreign sponsors want it to be clean too. France said it wants paramilitary groups disarmed before it delivers financial aid. The Czech President says ditto, he believes getting rid of fascists would be a right thing for the Ukraine’s leaders to do. The further scenario is almost predetermined, whoever wins the internal strife, its common Ukrainians who will suffer. Those days in Germany an average citizen was doomed to suffer no matter if it was Hitler or Röhm who grabbed the power. Only the repetition of 1945 can save the country.